Kids have been showing up dead on the streets. A new virus, granting the user powers for a limited period of time, is to blame. It seems that one of the bug's nastier side effects is that it needs continuous replenishment – if the user doesn't feed his or her addiction by siphoning energy from another super-powered individual, they slip away into nothingness. Thing is, nobody can survive the siphoning process and that's led to users cannibalizing their own ranks and a massive spike in deaths attributed to the disease. Deena has been infected, and it's destroyed her life... and now Retro Girl, under deep cover, is the helpless captive of a gang of addicts. Needless to say, this isn't an arc you're going to want to jump into mid-stream. New readers will find themselves quickly overwhelmed with this issue in particular, being the culmination of several long, interwoven story threads. If you don't know who Deena Pilgrim is, why it's such a big deal that she's developed powers of her own, or what it means to see her sitting underneath a green light in the interrogation room, you're going to want to keep walking. The action is fast and furious, and Bendis doesn't have time to slow down and spell it all out for you. Long-time readers, on the other hand, will continue to find themselves rewarded for their loyalty. Powers has been building to this issue for literally years, and it's an emotional roller coaster. This cast has never been so sharp, nor so emotionally charged. I've been following these characters for so long, I almost consider them to be distant friends. Bendis has been quietly building his toybox since day one, and the entire cast is so well defined by now that even the most fringe-level supporting character can jump right in and play a major dramatic role. What's more, he doesn't hesitate to throw major characters into the fire and, if need be, pull the trigger. I'd struggle to name a single book that's taken the kind of risks with their main characters as Bendis has with Deena Pilgrim over the course of the last twenty issues. As the peak of her latest progression, this issue is both her finest hour and her lowest point, and if you're aware of what's led up to it, it's utterly riveting. 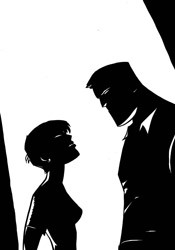 Michael Avon Oeming, the only artist the series has ever known, is finally showing signs of a return to form. His work has been on a downward slant in recent months, and maybe the influx of outside projects he's taken is to blame. Or maybe it's the jump to a larger monthly page count that Powers has taken. Whatever the case, his work has been suffering but this month is a return to form. His work with facial expressions, with dramatic lighting, with iconic still frames, it's all handled wonderfully from cover to cover. Especially the facial expressions... without an overlying narration, this story relies heavily on its effective use to convey emotion, and Oeming hits the nail on the head every single time. The oversimplified, rushed nature that had characterized his style in recent issues is mostly gone, and it's clear that he's taken a serious interest in making this issue all that it can be. My fingers are crossed he can keep it up. It's a shame that reading and enjoying Powers is so dependent upon the understanding of everything that came before, because this storyline has been downright phenomenal. If you're a member of the club, this issue is the cherry on top, an outstanding conclusion to an amazing arc that delivers on a dozen different levels. It's just not very welcoming to new readers, by its nature it really can't be, and that's a real tragedy. Longtime readers need to buy this, but fresh faces should borrow it, and every single preceding issue, from a good friend.